Most of Spotify's If This Then That recipes will be familiar to users of the recently launched Deezer IFTTT channel. When Deezer became the first subscription-based streaming-music service to integrate with rules-based automation engine IFTTT (If This Then That) last week, it was obvious that other services would follow suit over time. Few predicted that it would happen this soon. 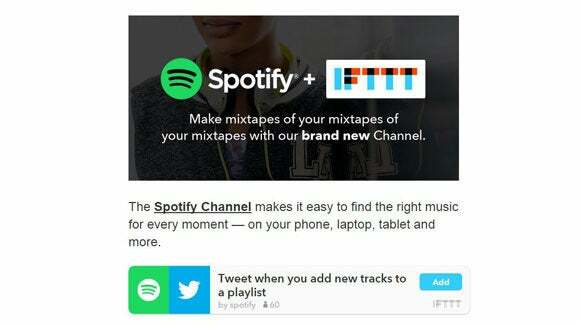 Spotify has become the latest music streamer to hop on the IFTTT bandwagon. “The Spotify Channel makes it easy to find the right music for every moment—on your phone, laptop, tablet and more,” IFTTT wrote in a blog post announcing the new channel. As of press time, the official Spotify IFTTT channel boasts more than three dozen recipes; simple rules that let users link Spotify to another service, so that an action on Spotify triggers an action on that other service. IFTTT recipes run the gamut of varyingly useful to downright bizarre, and the Spotify channel is no exception. Among some of the more useful ones are recipes that automatically sync any music you like on services like Soundcloud and YouTube to your Spotify account. There are also those that allow you to maintain a constantly-updated list of favorites in Google Drive or Dropbox. You can even match the color of your Philips Hue smart light to that of your most recently saved track’s artwork. The impact on you at home: Experience is the keyword here. Integrating with IFTTT opens up a world of possibilities for a product or service’s users, giving them almost unprecedented control over the way they experience it. Tying IFTTT and Spotify together isn’t something anyone needs to do, but doing so opens up plenty of fun possibilities.